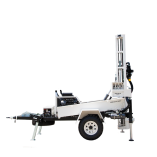 The PAT-Drill 301T is a fully featured top drive rotary rig able to complete holes in hard or sedimentary rock. 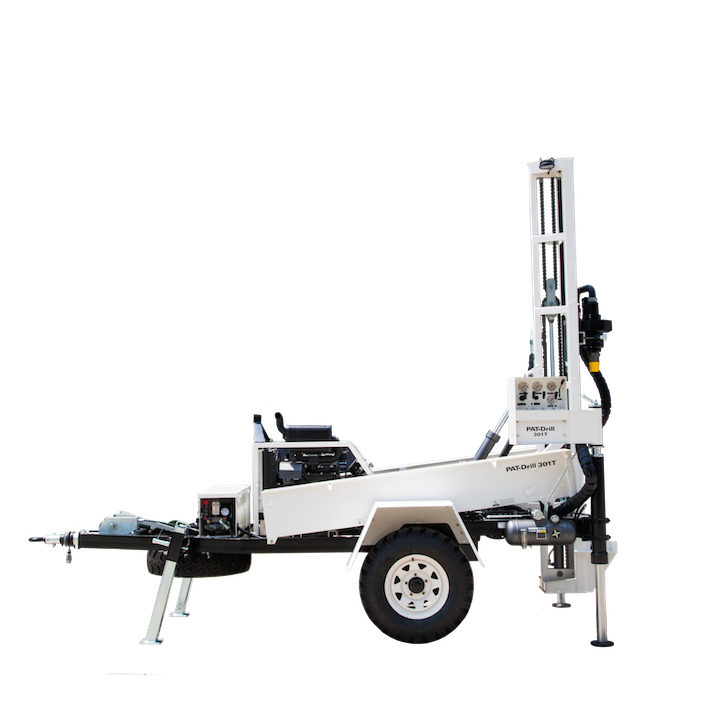 It is one of the lightest rigs in its class and able to be towed behind most common pick – up trucks. This is the PAT ‘best seller’ for rural water supply holes in hard rock areas. For down-the-hole-hammer and mud rotary drilling up to 150 m depth 100 – 152 mm diameter DTH & 200 mm mud – according to tool selection. 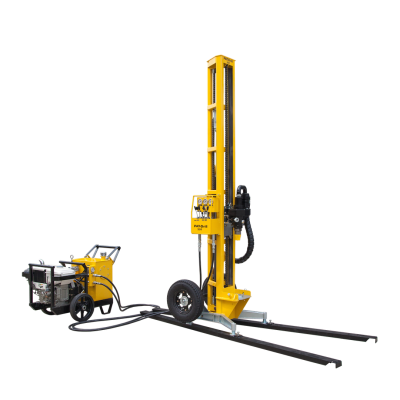 PAT-Drill 301T is a highly compact, mounted on trailer hydraulic drilling rig, available with all drilling accessories, easy to set-up and move. 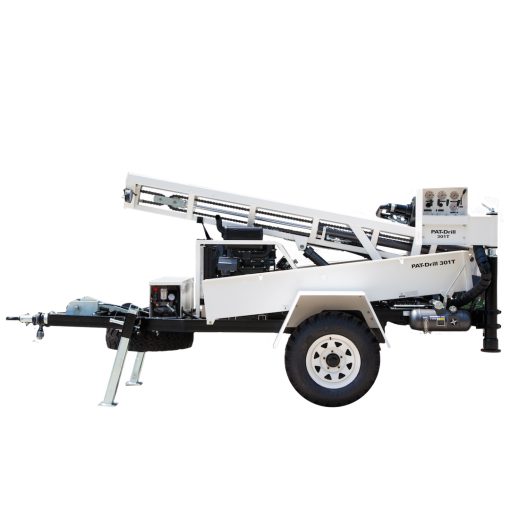 This is an ideal multipurpose rig, powerful, versatile and easy to transport across a variety of terrains. All steel work 3.15 M, break-out table to open 200 mm. Mast raised to vertical from storage position by a hydraulic cylinder. Yanmar 3TNV88 diesel engine 35 HP, water-cooled, electric start, with double hydraulic gear pump type. Triple piston pump 30 bar driven by hydraulic motor. Mechanical brake for overrun parking auto reverse. Single axle, torsion sprung with overrun brae system. 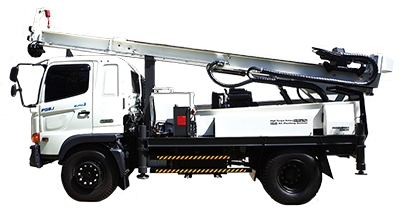 PAT-Drill 601 is a truck mounted drill rig powered by a deck engine mounted on a rail chassis to fit any suitable 15,000 kg GVW truck. 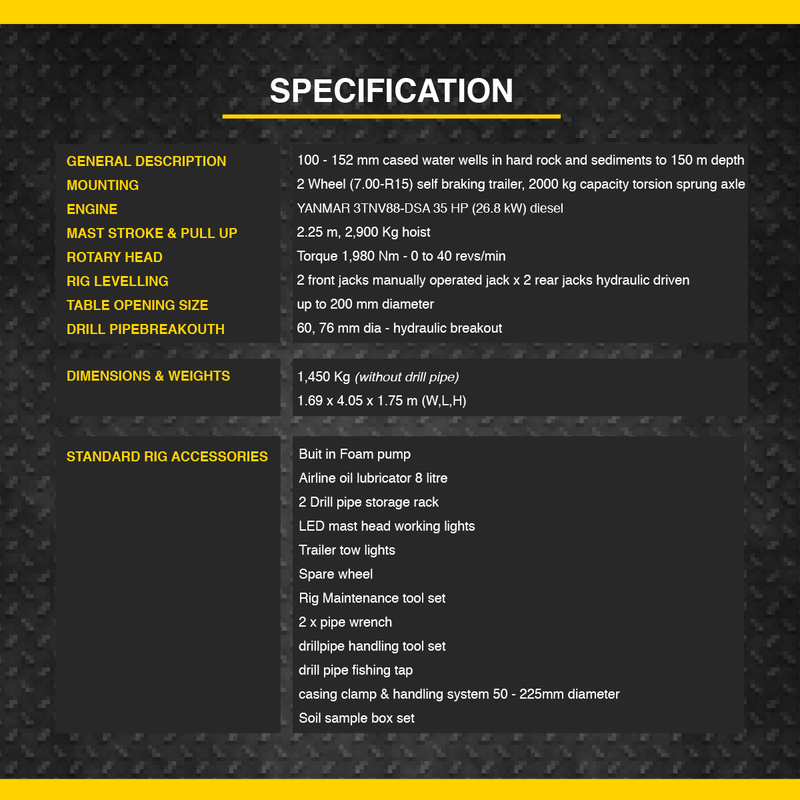 For down-the-hole-hammer and mud rotary drilling up to 400 m depth 150-305 mm diameter – according to tool selection. The oldest PAT-Drill model and still in constant production and has many design refinements through its 25 years. 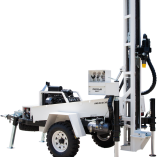 With a 'stand alone' mast unit it can be simply transported and man handled on drill sites – some with tight access. 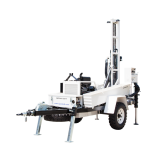 Rig is powered by a stand alone power pack with a heavy duty Diesel engine or lightweight Petrol engine option. Ideal application sedimentary mud drilled holes to 100 m depth 100-200 mm diameter. 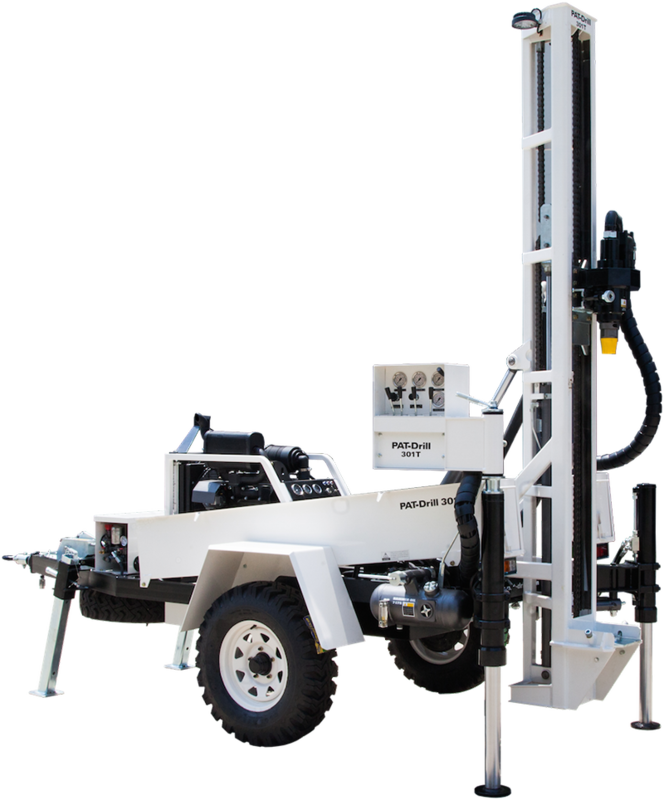 The PAT-Drill 301 remains a popular PAT Models having been developed and refined through 15 years of continuous production and deployment on a wide variety of international drilling projects. 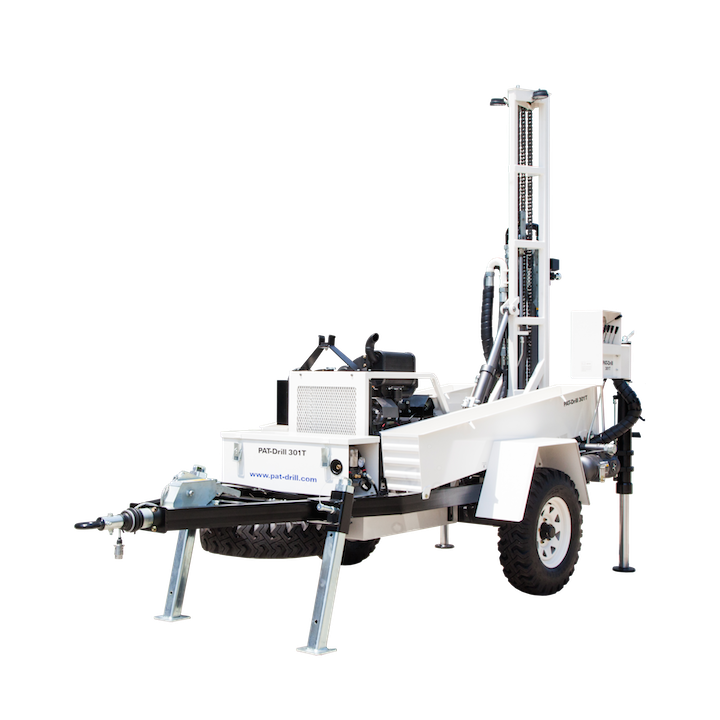 PAT-Drill 501 is mounted on bigger truck of PAT-Drill 431 robust with full hydraulic service, DTH-Hammer rotary drilling rig, ideal for deeper and more challenging water wells.